Have you modeled the front suspension design? and the anti-dive is backwards? As meticulous as Craig is I really doubt he has overlooked anything in his suspension design, besides, trying to make a judgement on whether the pivot is in the wrong position from a photo on the innernut is (um, how do I say this without seeming rude?) uneducated. I checked out your VSup link. Have you figured out how to use it? Anti-dive geometry positions the front pivot of the UCA higher than the rear pivot...exactly as seen in the picture above and below. The suspension geometry was modelled by me, then checked by Ron Sutton Link - Ron's a race engineer and he did the final optimization. No stone unturned etc. As for how it all looks - well, the pivots are what matters and I'm responsible for the design. 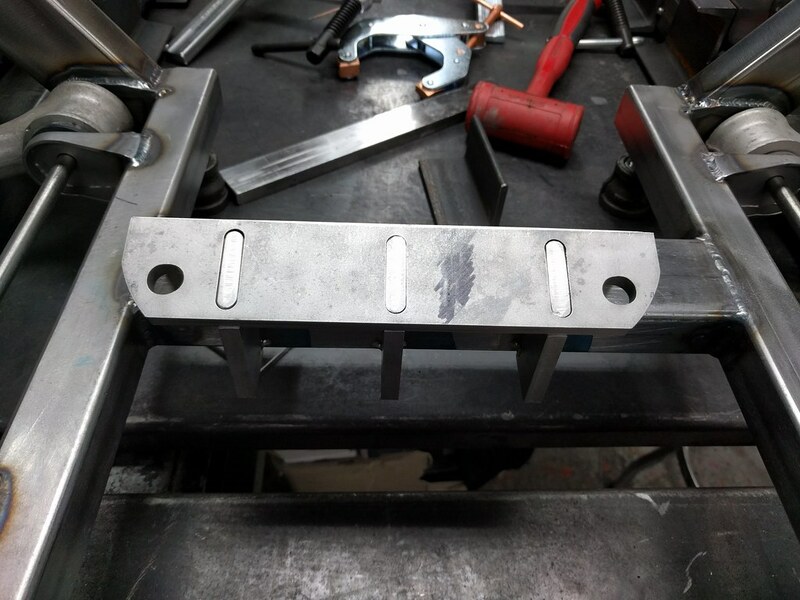 The idea was to place the UCA dog bone as close to the frame rail as could be tolerated to reduce the bending moment on the UCA bracket. As it sits, the LCA cradle is not sitting on the frame and the UCA is just plopped in place for show. Last edited by Canuck; 03-06-2018 at 11:25 PM.. I got up in the marbles there a bit! Can you tell my project chassis design is still in the wrinkled bar napkin stage? What yanked my chain at first was the arm angles in the pic. And the aggressive anti-dive angle spun me out. I'm going to have to model that and figure out why it set off my mental alarms. Is that not a stiff spring setup? Last edited by Dirty Rick; 03-07-2018 at 11:31 AM..
As a student of suspension design I have blundered a bit. I rely strongly on my visual measurement abilities to analyze what others are doing and ask questions why if things don't appear "correct". Once I really irritated a racer who I was assisting in a "between rounds" crash repair when I observed that the replacement RF upper control arm that was being installed was bent. The rules did not allow non-OEM A arms nor was it allowed cut or weld an arm or relocate mounts. So he had put the arm in a press and purposely bent it to make it shorter for camber gain. My calibrated eyeball had exposed his Top secret "cheat"! 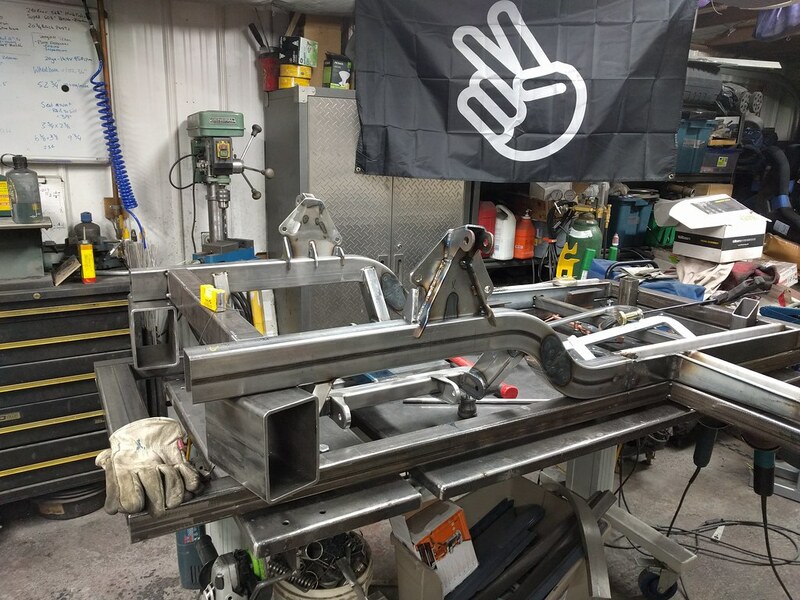 Then there was the Quarter Midget chassis I built where I copied from pictures some designs Gary Stanton was experimenting with on a car Ray Evernham drove. That QM chassis reset track records up and down California, my phone rang for weeks from racers who wanted to buy one every time a record fell. So as a Track Champion and a Rookie of the Year and with my hand in more than one National event win under my belt, among my other achievements I find it hard to classify myself as uneducated. Thankfully I am much more often right, than wrong. Stay tuned, I'll be asking more stupid questions. This amount of anti-dive is actually a little less than the stock Corvette C4 that it's based on! Here it is tacked in place - not that this angle helps matters. I'll take some more explanatory pictures later. In the picture that tossed you - I should also mention that the frame is tipped forward a couple of degrees (i.e. it is not level)...but it still looks like a lot. Here't a good factory drawing of the stock geometry. The UCA also has the ball joints located to take some of the apparent angle out. Just to review (and I'm not an expert) but conceptually, the idea of anti dive or anti squat geometry is to transfer the weight associated with motion (either + or - acceleration in this case) through the suspension links and not just the springs. In the stock suspension (with no anti dive) the only option you have is to increase the spring rate to counteract the weight transfer associated with the acceleration. So two methods, one desired outcome - reduce the vehicle attitude change under acceleration conditions. So you can then set spring rates based on other dynamics instead of just the desire to not drive a barge. The cost is that this angle impacts wheel bump characteristics...a load is a load so if your links are preventing you from moving weight excessively under braking, the converse is also true - if the wheel is bumped, it will resist the movement. In anti squat, it works for you as the location of the links (and the geometrically constructed "virtual link") are favourable to say a bump in the road. On the front, you get the opposite effect. So you don't generally design in a lot of anti squat as the associated cost is a rough ride. So with the right balance of anti dive you should be able to run less spring rate for a little more driver comfort with improved "handling". Thanks. I have been looking at this for a day now and still can't wrap my head around it. Help me here, is it the rotational torque from braking that causes the anti-dive reaction, or the thrust of the wheel being pushed back by braking forces? I am thinking the thrust forces are greater so that would be the forces in play. But with the rear upper mount below the ball joint I see the chassis levering under the ball joint, not pushing down on it. I am a fan of softer spring setups because, "Any suspension design will work if you don't let it"
It seems to me that Lighter springs have more stored energy and unload less within a given travel. Load transfer causes the change in attitude in response to acceleration. Make a free body diagram to work out the basic kinematics. There are a few good YouTube videos (some not so good) but there is no need to overly complicate the topic. The Mechanical Engineering folks at University of San Diego https://www.youtube.com/watch?v=7QZ5z66PhdU have done a good little video series that is better, in my opinion, than many. I also stared at the silhouette that Craig posted. I was scratching my head, too! The vid sorted it out pretty well, although somehow I think (?) it also has something to do with trying to compress or twist a quadrilateral. By that I mean the box formed by connecting the four pivot points created by the UCA and the LCA around their perimeter. Hope that's clear. Wishing you continued success! Thanx for the Ron Sutton link, Craig. I've been thinking about building one so doing some research on Locost 7's and his site will come in handy. DR, I see Craig posted a U tube while I was slowly typing! I typically like EE's version of things...this is one that I don't like. Not "go to YouTube and tumbs down" don't like, but he's super rushed and just not giving it enough detail to power home the idea. What I'm left with is "you want this, but not too much" - speaking as a scientist, it's just a bit mushy. Now in one of my original videos, I bumbled my way through why I picked the suspension I picked and just said to go read up on it. That's not really very satisfying either. The lecture I posted is much better - reading Thomas Gillespie's "Vehicle Dynamics" and the classic by Milliken and Milliken "Race Car Vehicle Dynamics" if you're a person that learns by reading. What I can say is that looking at these things in 2D is difficult as they are 3D systems...so for a simple suspension (say a stock 122) - a 2D diagram or model works fine...it just won't work for what I am doing. When I first started studying this stuff it was a challenge as I wanted to know what "optimal" was for a car. More engineering than physics (no slight to my engineering colleagues) - you know, something to get my design started and get me into the ball park - somewhere past a Radio Flyer. Every car is a different system. So, as I was already committed to stuffing an IRS and changing the IFS (as I had determined that fixing it (whatever that means) wasn't in the cards). Now I had sold parts, bought parts, started building jigs and still was as clueless as they come. I had, however, read all the books (yup - all of them - JK - most of them...I have a shelf with many books). Then I started with what I had to see what it would do (in software) and I'd started racing and modifying my 242. Racing works to sharpen up your understanding. I had 4 different suspensions in my 242 in a CANADIAN race season. Then I got nervous - I'd crush my 242 if it came to that...I wouldn't crush my 122, I love that car. I just like my 242. So I'd done what someone with only book learning does, asked a few stupid questions got a few things right and many wrong. Then I emailed Ron after a frustrating conversation with a guy who wouldn't sell me race coil overs (looking at Penske's at the time) because I was building it myself and for sure was nuts and an idiot. Seriously, he was never going to custom valve a set of coil overs for some garage engineered death trap (his characterisation of what I am doing). Ron was just the opposite. Very helpful. He basically just checked my math. 1. Get the Howe Racing lower ball joint that is 1/2" taller. It effectively makes the spindle taller. This improves camber curves. 2. Reduce the "Stock" anti dive of the front suspension that I had by lowering the front PIVOT by 1" and keeping the stock lower pivot location. I high light pivot because you don't lower the mount hole by that much in relation to the pivot. 3. Move the UCA back in relation to the wheel centre by 1". That's it - the rest was as we found it. Now, I put "stock" in quotes as this was not in reference to what GM planned, but the suspension that I bought. I contacted that guy and asked him about why it was the way it was and he said it was what GM engineered and best not to ask questions. Turns out what we optimized is pretty close to what GM engineered (latest edition of the C4) not what should have been there. The UCA mount was all wrong from the start. That led to a quick redesign, which I couldn't square -> how come I did my own design. Last edited by Canuck; 03-07-2018 at 03:35 PM.. Reason: Forgot stuff. Thank you for telling us your way Craig. I tryed to do some modifying and building my own suspension too. And the more i did learn, the more stupid I did feel. In the past I did try and error, a lot of error. I started to test suspesnion programms and wasn't happy. the ceap ones are not really better than the card and ribbon design, the expensive ones: expensive! I didn't and won't have the cash to buy this programms. Your build is way of what I will do. Too much at the same time. Next step would be to build your own body. And to build a body out of scratch is waaaaaaay more easy than building a suspension out of scratch. I'm really impressed of your way and your motivation. I don't have the time and the money to build something like this, for bad luck. with the help of Ron it will be a success. Without it will be sucking, I'm shure. My experience with shocks and springs was a hard way of learning. In the end we found a very good working suspension even with a living axle. good luck, the follow on youtube is more difficult to me, lame w-lan access and not my natural language. Craig, the vid from EE was the first I found and I liked it because it cleared up in my head at least how the anti dive is calculated. The simple diagram showing how it can be adjusted by % from 0% to 100% was simple. Maybe a bit too simple to actually design around, but clear enough to get me in the ball park. I'm not sure it makes sense. If we define the quadrilateral as the intersection of the pivots, then they don't move...and the length of the links doesn't move. So there is no change in the volume described by the links and the ball joints/spindle. That doesn't mean the the shape that holds the volume is constant - it won't be. I've moved it up and down a lot - it doesn't "bind" - by design it moves in an arc (camber/caster are dynamic). 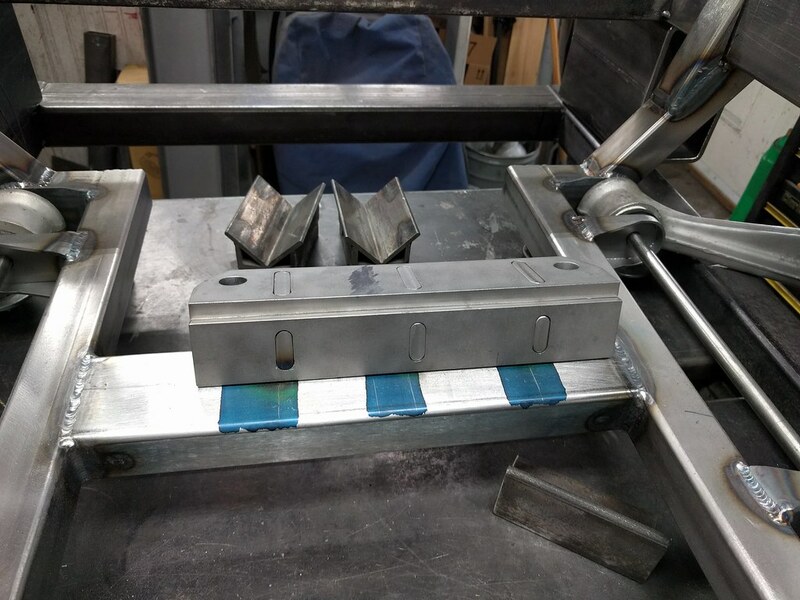 I've got computer simulated camber curves and will plot them when it's all welded in to validate that we've got it right. In the lecture, the professor defined anti dive geometry as changing the direction of the force vector through the link formed by the virtual pivot for the suspension. This change from an initial horizontal plane necessarily has a vertical component. So it's this vertical component that resists the deceleration force. I'll elaborate a little. I thought of it this way - if both arms are parallel to the ground then under braking, the force vector remains parallel as the instant centre of the suspension in the side view is infinite and the only thing preventing this from having the virtual car slam into the ground is the spring. The spring has to counter act the change in weight seen at the wheel. If there is an angle to the links that cause these points to intersect and create a shorter virtual arm (it therefore pivots instead of going straight up and down), then the acceleration force acts on the pivot through a moment arm created by the contact patch and pivot. This change in the direction of the force vector creates a vertical force resisting the rotating force of the car. Not clear enough to engage in arguments or finger-wagging on the internet...but clear enough that I think I understand what's going on. OK, what I left out of my hair brained quadrilateral theory is the fact that the ball joints allow the spindle arm to rotate with (follow) the arcs created by the UCA & LCA. Duh, I'm still crawling out of the muck with this stuff! Thanx for taking the time to address it though. In the future I'll try not to take you away from more important matters. As far as the C4 front short/long arm wishbone suspension, I'm certain GM spent 6 figures + getting the geometry right for performance caster & camber. Are you duplicating what they designed, or modifying it for your vehicle weight and loads? I'm looking forward to seeing & hearing that whiteblock purr...... or has that been shelved for other power? Well, I have evolved what GM did with the changes...in some respects it's more or less what those with serious competition C4's run. I've been able to make some changes that they can't on a stock subframe without a lot of work. Power is going to be whiteblock. Never waivered on that. Just sorting out those details in the background right now. The engine will go off to the machine shop in a few months. I really don't need it for a while...I have a mock up block. Power is going to be whiteblock. 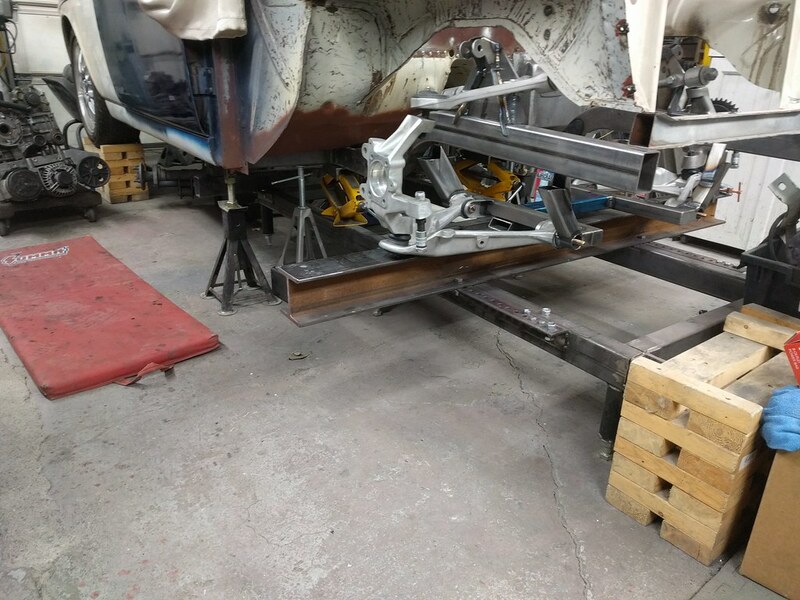 I built a "Pro Touring" suspension (nearly all bolt on, nothing like your work) for my 70 Chevelle. I chuckled when I read the Howe Tall Ball Joints (NASCAR Origins I think)... I have those on the Malibu. GM camber curves were a disaster back in the stone age, as the stock suspension traveled the curves went negative! The tall BJs fixed that, along with adjustable UCAs which let me build in some caster (I think I am right at 4*)..... it tracks down the interstate like a cruise missile. I'm with you on the whiteblock power..... got my 92K mile engine on the dolly, small bore B5244T5 which I understand tolerates boost quite well. Johann "The Man" in the Netherlands says several of his friends run these making 350 ~ 500 lb.ft. at the crank with stock internals....my plan is to keep them stock. Waiting to see what type of exhaust mani you build for the 5 cylinder. Keep it up! Fun to watch your progress. Last edited by DET17; 03-11-2018 at 07:57 AM.. It's an interesting progression over the years. The early cars had a narrower track so my car's parts came from a 1986 (Z51...not that it matters) - they originally were 59.6" (wider later) and we've reduced that to 56". First we changed the geometry of the UCA mount by moving it back from the axle centre line 1" and lowering the front pivot point 0.25" (rear pivot didn't change) - I may have reported this value as something else before. I'm now looking at the report, so will get the details correct. Using the Howe 1/2" longer ball joints as noted. Why is this a good thing?? Well, the increase in caster allows you to run less camber and optimize the tire contact patch when turning. The camber gain with a steering angle of 25° and 1" dive/ roll 2.5° yields an additional 0.6° of camber for 1.2° from my set point. I may need more depending on the tire I'm running. Where I'm positioning the steering rack will place the Ackermann at 99.9% in this condition. The anti dive % would be 54.5% which is excellent. Total roll centre height movement is from 3 7/8" to 2 3/8" and is one of the benefits of the longer ball joints. This is considered excellent. Other interesting stats. Roll centre migration is 2.7" - not bad. The virtual swing arm length is 109" which is also good. 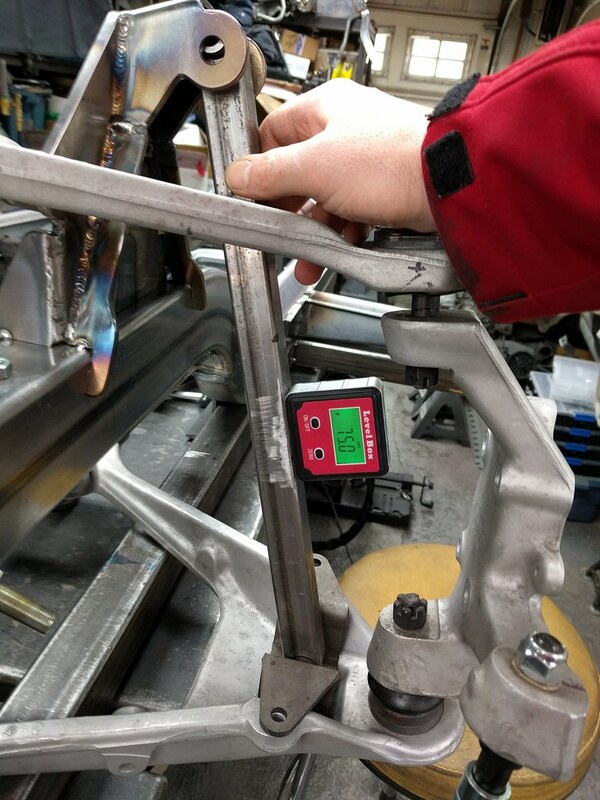 With 1" of dive, the caster gain will be 1.2° - depending on how the car feels, we can back the caster off a bit. The idea with the whiteblock (like all my engines) is to change out the rods for H-Beams and remove that fuse. I've gone with the 147 mm length rod and will have Wiseco knock me out some pistons to suit when the time comes. I'm pinning the block and will be running a Borg-Warner EFR turbo (still debating the end size). The manifold will be 321 stainless and some of that is already under design. For fun. Here are some numbers I found online. It's Monday - I'm making progress. Finally moving on to the welding of the front clip. Still making progress. Here's the latest video. I'll try to get a post done up soon. OK - Time for an update. Honestly, I'm hammering on this thing like a drunken blacksmith but it just doesn't look like I'm making progress. One of the problems is that I keep running into little snags related to how much time has passed between purchasing and installing parts. I started writing a separate build journal for all the details several years ago, but most of this predates that (or precipitated) effort. Exhibit A - The Case of the Buggered Steering Rack. Tony: Yes, I know exactly what you need. What are your pivot dimensions. Me: What sort of rack do you think would be best?..oh and 21". Tony: You don't want to steer too quickly for a street car - 2.36 turns lock to lock is fine. Me: Interesting. What kind of servo or parts and things will I need to put this together? Tony: Great, I'll pass you back to the billing people. That's about how it all went. Parts come in. Look fantastic. I don't need them for years. Sit in the basement parts stash collecting dust. 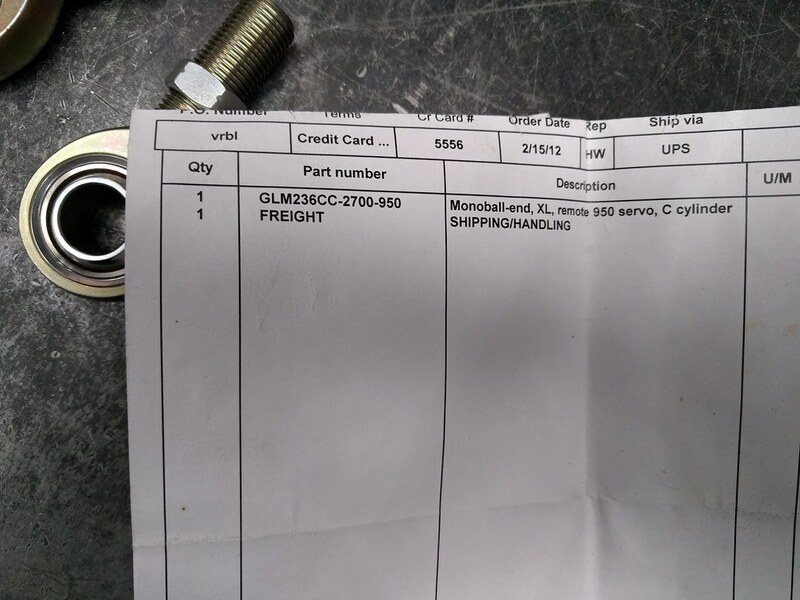 Scroll back to the picture of the bill - decoding the part number is critical...GLM is the style of rack, 236 is the turns lock to lock...C is the cylinder, 2700 is the pivot to pivot in inches, 950 is the servo. I noticed this about 3 months ago when I was trying to look up the mount details and spoke to Tony on the phone again. I was wondering if the online instructions that required 3/8" plate for the mount was required. It is. I asked Tony about the rack as it wasn't supposed to be 27" pivot to pivot. He had no clue...I told him that I measured it and it was 21 - he reply's with "Well, it's 21" then!" This is what causes stress people. Alone on an island with bad paperwork and not enough knowledge. So I just put the rack on the bracket and tacked it on the frame. Well, after I scribed a few layout lines. I was very careful with these fits...in fact the parts only go in one way as I didn't square up the laser kerf. You have to tap it together when installed. I'll cover the how's and why's on a future video. Then it was back to the string to check the pivot positioning and a little test of centre with the square. It should be 2" from the frame rail to the pivot. Yup...that'll do. Now it's on to the coil over mount check. The design says 15° inclination. So that was where we were at about a week ago. I've spent the last week working out the suspension dynamics to buy anti roll bars and coil overs. I have stumbled and fumbled around with this as I'm working through it long hand, don't like witchcraft, and need to be able to understand what I'm doing (I'm not a software monkey - I'm a scientist dammit). So that's taken some time. I may post the method when I understand it - but also understand that it's pretty niche market on the who cares scale. So now you're caught up. Craig, Here's a short version of how I did mine, see if you agree. 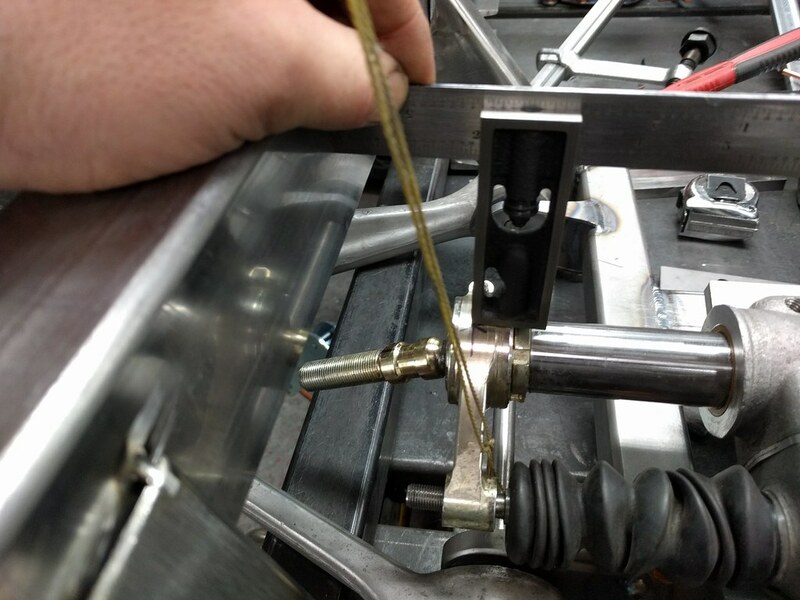 After pulling a string on both sides between the center line of the UCA & LCA inboard pivots I calculated that the center of the steering knuckle tie rod end ball was 4" (IIRC) above the center of the lower ball joint ball. I then transferred this dimension (4") to both strings above the LCA pivot. Then measured between the strings at this dimension and came up with 17" (IIRC). This meant I needed a rack with 17" between the centers of it's pivot balls that would be mounted 4" above the LCA pivots. By doing this I will have the steering link between the rack ball and the steering tie rod that is parallel to the LCA so that they move in conjunction without causing a bind (bump steer) What say you? That Woodward fab stuff is beautiful but they use too many gold parts for my pocketbook! That's exactly how I did it. 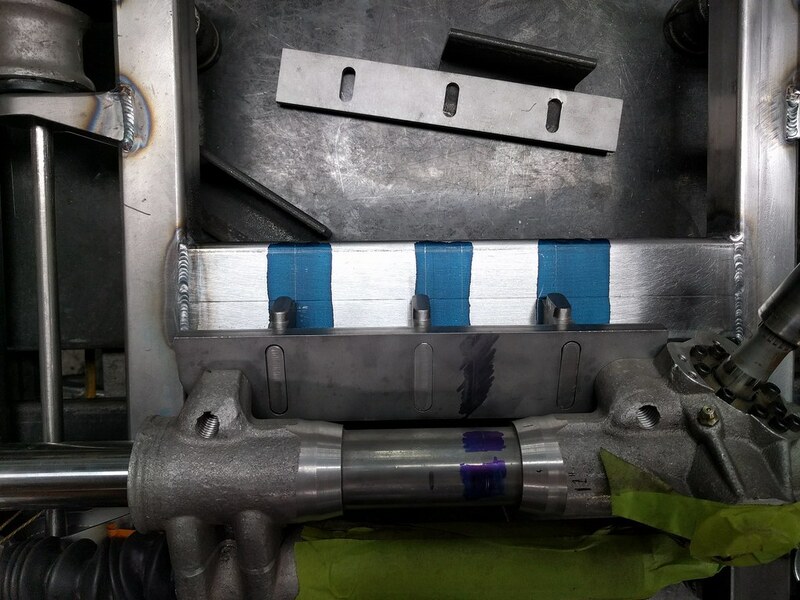 The end location was verified in a 3D suspension analysis program where Ackermann and bump steer measurements were conducted. Trust me, when I got the bill...I almost died. I paid more for the steering rack than I did for the car . Not kidding even a little bit. Using the stock cross member prevented me from moving the rack rearward enough to get the Ackerman correct. That's where you and I differ, I was like, well fork, let's just see how this works. It works OK by me, I don't notice anything wifty! I verified all the geometry by cutting up manila folders to represent all the suspension components and pinning the UCA and LCA to a board, using small nutz and bolts for pivots and doing some I guess that will work analysis!